A long (up to 1,620 mm or 60" in total length) and exceptionally thin snake that closely resembles a vine. Coloration ranges from gray to silver-gray or copper with short, dark, dash-like lines at mid-body. The head is very narrow, pointed, and elongated. A medium (up to 1,070 mm or 42" in total length) dark olive-gray snake with a single orange-yellow stripe down the middle of the back (mid-dorsal stripe) and an additional cream or white stripe along each lower side on the 2nd and 3rd scale rows (counting up from the belly). 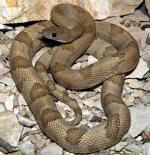 A large (up to 1,219 mm or 48" in total length excluding rattle), brown, gray, yellow-brown, or golden yellow rattlesnake with a series of large, black or brown, blotches on the back (dorsal blotches). It is a large (total length, 85-150 cm = 59 inches), slender colubrid snake with a long head, large eyes, and smooth dorsal scales. Each dorsal scale contains two apical pits (Price 1990a, 1990b). It has a row of small scales (suboculars) between the lower border of the eye and the upper labials. This is a beautiful snake, yellow to tan dorsally with a series of black or dark brown H-shaped markings. The eyes are large and prominent, light-colored with contrasting round black pupils. The tongue is pink. Dorsal scales in 31-35 rows. Ventrals 260-277; subcaudals 69-79.